The Collapse of Morandi Bridge in Genoa and a seafront boardwalk in Vigo. 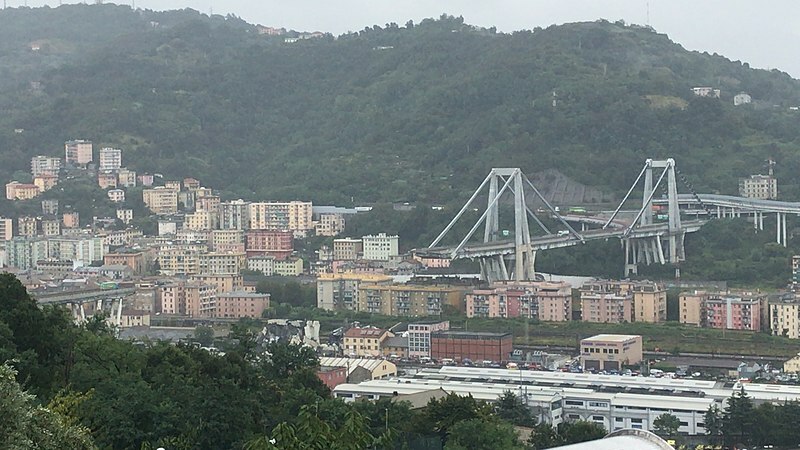 Astrology, Events and Places: astrogeographical data and analysis for the collapse of Ponte Morandi in Genoa, Italy and of a promenade in Vigo, Spain during an exact Jupiter – Neptune trine. 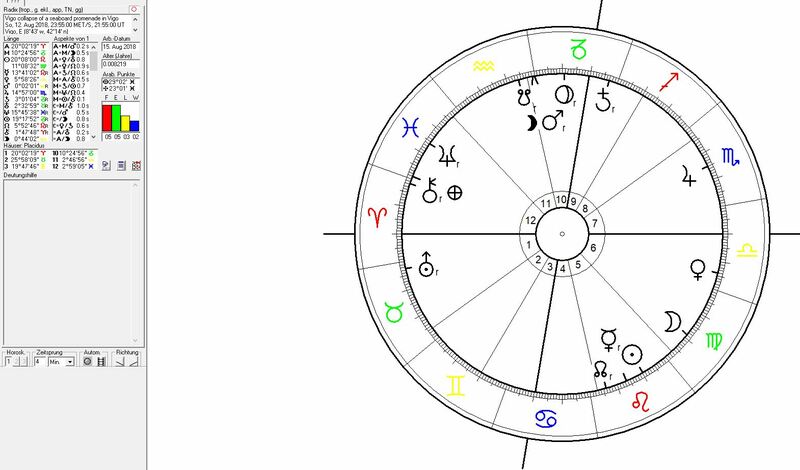 Astrological chart for the collapse of Ponte Morandi in Genoa, Italy calculated for 14 August 2018 at 8:51. The catastrophy occurred during heavy rainfall which seems to have been a last triggering factor for the collapse of the bridge. The ascendant was at 18° in air sign Libra the sign of bridges and a degree that ist known fro its triggering quality of long suppressed tension (from Saturn to Uranus eruptive quality – compare Döbereiner). 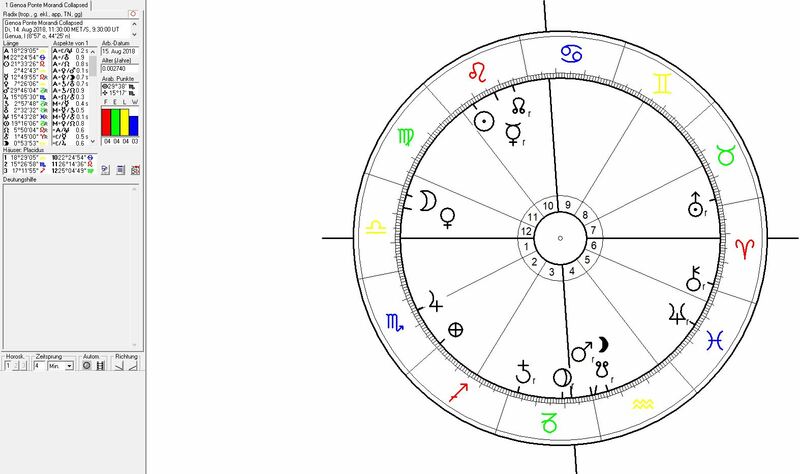 Venus as AC ruler was conjunct the Moon (triggering planet for rainfall) in house 12 the house of instability. 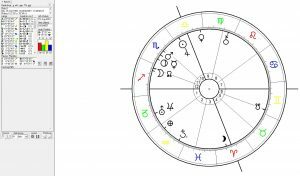 The Moon`s transit over 2°Libra had just activated a square to Saturn the planet of stability and located at 3°Capricorn the sign of administration in a position resonating with the administrational control of such building strucutures. The conjunction of the Moon with Venus in Libra square to the administrational control (Saturn) and opposite Chrion the ruler of Virgo (carefulness) at 1°Aries indicates nepotism, bribery (Venus in 12) and naivity (Libra) as the problematic factors. The fact that Jupiter astrogeographically the actual triggering factor of the event was just on the cusp of house 2 (placidus) the house of foundations of a strucuture explains the instability of the foundation, and a movement (Jupiter) of ground as the cause for the collapse. As an indicator of the long-term causes for the catastrophy Jupiter stands for the priority of profits (house 2) and in harmony with the neglction of control and authority through hidden corruption (Neptune in Pisces in house 5) as causing factors. .
Astrogeographical position of the wooden promenade in the Yacht Harbour of Vigo for morphogenetic field level 1 which describes the supraregional resonance impact of the bridge and the incident: the astrogeographical coordinates of the site are 15° Libra and 6°Gemini. The 15°Libra coordinate of the harbour of Vigo was under intense pressure through a hidden mirrorpoint opposition from Neptune the ruler of Pisces and factor of instability in his own sign Pisces the sign of the sea. Neptun´s exact trine marking the climax point of a harmonious relationship with Jupiter the planet of movements is so to be seen as the causing factor for the instability of the wooden strucuture. The transit of Venus ruler of Taurus the sign of the earth, ground, heavy weight and gravity over 5° in Libra the sign of relationships, stage performance and dancing in trine to the 6°Gemini astrogeographical position of the Vigo harbour could indicate the audience`s positive excitement. 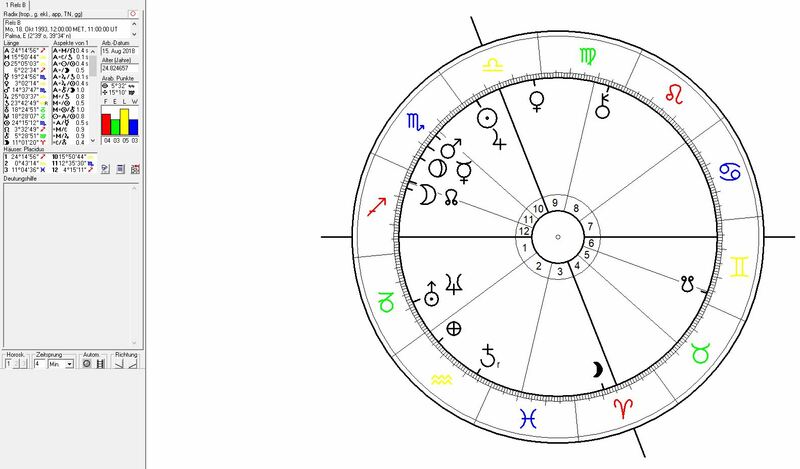 Astrological evernt chart for the collapse of a seaboard promenade in Vigo on 12 August 2018 at 23.55. As the event occurred with an Aries ascendant and its ruler Mars in Aquarius on the cusp of house 11 intense movement and excitation of the audience and/or jumping has to be assumed as triggering factors for the collapse. The start of the last concert of the festival with Mallorquin Rapper Rels B had been scheduled for 23.55.